Here you will, find loud and clear, details on how to grow rhubarb. There will be no mutterings and mumblings from me of rhubarb... rhubarb... rhubarb, definitely not. Follow this advice on growing rhubarb and then you can sit around the table eating your rhubarb pies and going rhubarb... mumble, mutter, amongst yourselves. Anyone can grow rhubarb, even mumblers (including teenagers). Even if you ignore rhubarb... it will ignore you (like teenagers), and still grow. Like family it hangs around and will be with you for years and... forever really. More tips on how to grow rhubarb — including the scary bits! Too much oxalic acid is poisonous, and rhubarb leaves have it in spades. Although there's a bit in the stalks, don't forget there's oxalic acid in spinach, beets, cabbage and other vegetables. But with a good diet, we can all handle as much oxalic acid, arsenic and traces of other poisons that nature gives us in healthy fruits and vegetables. That said, rhubarb leaves go overboard, so trim them off as soon as you pick the stems. By the way, cover leaves with boiling water and let steep for a day or so, dilute 1:10 with water, add a dash of liquid soap and use as a pest spray for other plants. 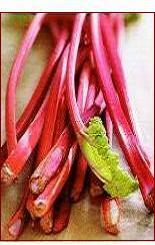 Pick rhubarb stems when roughly 30cm (1ft) or more in length. Colour doesn't seem to count. Colder weather often produces red stems, or if you hanker after the red colour, find a rosy stemmed clump and ask for a crown from it, or when you divide your clump, save only the red crowns to replant. When harvesting rhubarb, carefully hold stem near base and pull down and sideways to break it off from clump. Leave at least a handful of the inner stems and leaves to keep on providing food for the plant. If your stems are small and spindly the first year, leave the plant to get stronger, and make friends with another rhubarb grower to hopefully get invited to share their luscious desserts. An important tip for how to grow rhubarb successfully is, don't be greedy and eat all your rhubarb at the end of the season, you must also leave some good leaf growth on to help your rhubarb build up a strong base of crowns and roots to produce well for you next season. For the same reason, remove any seed stems as they appear. Vegetable crumble with lashings of cream doesn't sound too mmmm, but rhubarb is botanically a vegetable, not a fruit. Whatever — most bugs don't care for it, so it's all for you! For ideas on controlling pests and diseases, go to pest control. That's all on how to grow rhubarb. Now for some eating. Tender new stalks can be eaten raw. They can be chopped in fruit salads or soaked in a honey and lemon juice mixture. Stewed for 5-10 minutes in sweetened liquid they can be swirled with cream or custard, and of course are perfect in pies and crumbles. Growing rhubarb is worth it for the 101 ways to eat and enjoy it... go to it!